You don’t revisit the hurt because you don’t want to start another fight, but nothing ever really gets resolved. Or worse, the resentments increase over time as the hope you once had that things might change begins to dissolve and you begin to wonder, How did my marriage get so bad? How did we get here? And how do we fix it? You’re simply doing what you know how to do. 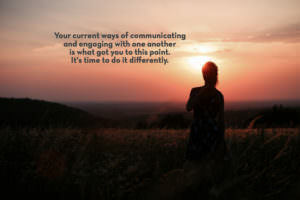 This is the only way you know how to communicate or engage with your partner. But that way of thinking is what got you to this point. And you can’t find the solution to the problem with the same thinking that got you here. It’s time to change the rules and set emotionally healthy boundaries. It’s time to get the clarity you need to know whether this relationship can feel good again or if it’s time to lovingly release it. And it is time to shift your thinking…your way of being…and the way you engage in order to see if something new can be created – because what you’ve been doing is what got you here. If you know how to do all that…awesome, you’re all set. If you don’t, maybe you should consider engaging with someone who does. You can apply and schedule a complimentary Truth & Clarity session to see if I can help you do this differently.